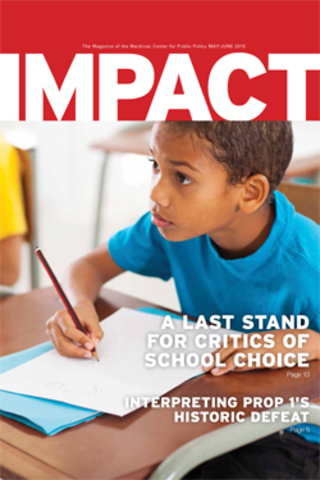 The study co-written by the Mackinac Center and the Manhattan Institute is available online at here. 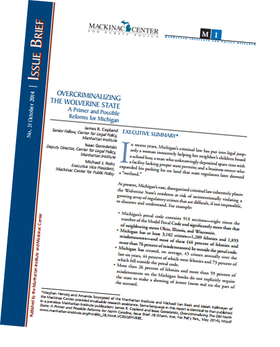 In October 2014, the Mackinac Center and the Manhattan Institute for Policy Research published a study noting that Michigan has more than 3,100 criminal laws in statute. The study recommended that the state review the criminal law and eliminate unnecessary or duplicative crimes. In February 2015, House Republicans announced plans to reform the criminal code, starting with a working group led by Rep. Chris Afendoulis, R-Grand Rapids Township, and Rep. Kurt Heise, R-Plymouth. The committee began its work by identifying criminal statutes that could be repealed, as well as adjusting penalties to more appropriately reflect the severity of the crime. Selling artificially dyed baby chicks, rabbits or ducklings. To many observers, these activities fail to rise to the level of criminal activity, but an individual convicted of the actions could still face fines and jail time. Eliminating antiquated or unnecessary criminal laws is a good first step toward addressing the problem of overcriminalization in Michigan. The House is also considering reforms to the state’s civil asset forfeiture law, which allows law enforcement agencies to seize the private property of individuals who have not been charged with a crime, much less convicted of one. Meanwhile, the Senate is considering a bill that clarifies whether criminal defendants can be convicted even if they did not know they were committing a crime. These changes would help ensure that the state’s limited resources are concentrated on truly serious crimes, while also reducing the likelihood that a well-meaning person is caught up in a criminal investigation.